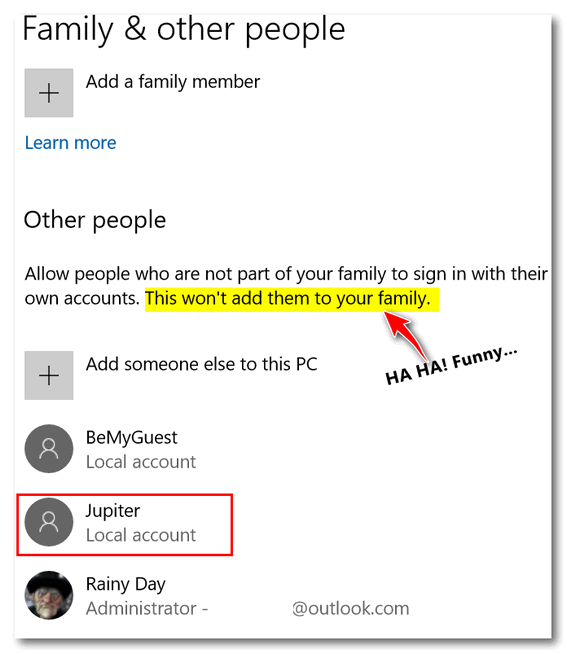 If you want to add a new local (not Microsoft) account your Windows 10 computer, here is a quick way to do that. For my example today, I’m going to honor a fictional person (NO! NO! Not EB, she’s not fictional!). I have a favorite character in a book I’m writing (it may never get done). Her name is Lucy Jupiter – she’s a hero. So in her honor, I’m going to make a user account for her today… a new Windows 10 local account named Jupiter. 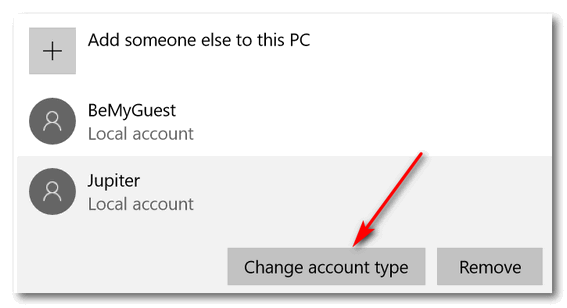 Here’s a quick and easy way to add a local account to your Windows 10 computer. Type CMD in the Windows taskbar search (Cortana). Where you see <username> type the username you want to use without the brackets. In this example, I’m going to use Jupiter as the user name. Instead of <password> you’d type the password you want to use for this account. And if you did that correctly, Windows will reward you by reponding: “The command completed successfully”. Now open Settings (Windows key + i) and click Accounts > Family & other people> Other people and you’ll see the account you just created. And as you can see, there is good old Jupiter. Now can I make Jupiter an administrator if I want to? Of course! And it’s easy. In Settings > Family & other people > Other people, click on Jupiter and click the “Change account type” button. And then click the down arrow next to Standard user, choose Administrator and then click OK.
And voila! 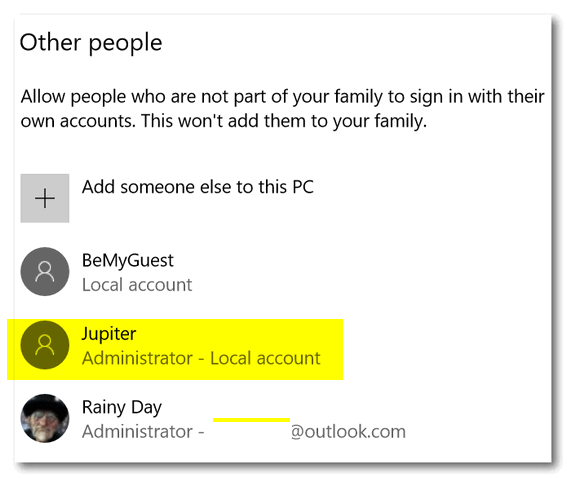 Jupiter (or user new user) now has a password-protected, local account with administrator privileges. If you set a password for your new local account, make sure you remember it – or whoever you made it for remembers it – or this account will be useless. If you want to try out the new account, press Windows Key + L. Click the lock screen, on the log in screen you’ll see your new account. Click to select it and log in. The first time you log in it will take some extra time as Windows will set up the account for its first use. Why would you want a local account?? Just curious. A local account is not a Microsoft account. It’s does not require a password.